This week the children have been learning all about the life cycle of flowers and discovering how they can collect their own seeds. They have already been learning about fruit seeds but have questioned where we find flower seeds? Marlon brought in some Calendula flowers which were the perfect flower at this time of the year to observe all the different stages, from bud, through spectacular flower to seed pod. Our Little Forest Folk-ers were able to explore and examine the flowers using their senses, touching them and smelling them so that they could closely observe the different parts. Marlon wondered if anyone knew where the seeds came from to grow the flowers and the children contributed lots of ideas. Some children thought we could get some from the gardeners, some thought from a shop, some of them knew there were seeds somewhere inside pods. Using the plants Marlon indicated and explained how the flower evolved and eventually formed the seed head from which the tiny seeds could be collected. We then gave each child a seed pod and asked them if they could roll it between their fingers and collect two or three tiny seeds. After they had collected their seeds, the educators encouraged them to come and fill a pot with compost so that they could carefully plant their seeds. We will now be watching with interest to see how our seeds grow over the coming few weeks inside the gardener’s greenhouse. Halloween arrived in our forest on Wednesday with a big splash of orange! We had super spooky satsumas for snack and the children had the opportunity to explore and experiment with some large pumpkins. Two had been bought from a supermarket and one had been grown in Jo’s garden. When the top was cut off the seeds inside were revealed which the children removed using ice cream scoops and their hands, particularly enjoying the sticky, stringy textures inside. Some of the children noticed that although the pumpkin from Jo’s garden was smaller than the shop bought ones, the seeds inside were actually much larger. This also led to a discussion about how pumpkins grow from seeds and that these could be collected like our calendula flower. Some of the children decided to take a seed home to grow their own pumpkin. They then carefully used palm drills to make holes in the pumpkins and then used pens to decorate them. Some tried to make the biggest hole they could, others used their palm drill to make faces on their pumpkin. 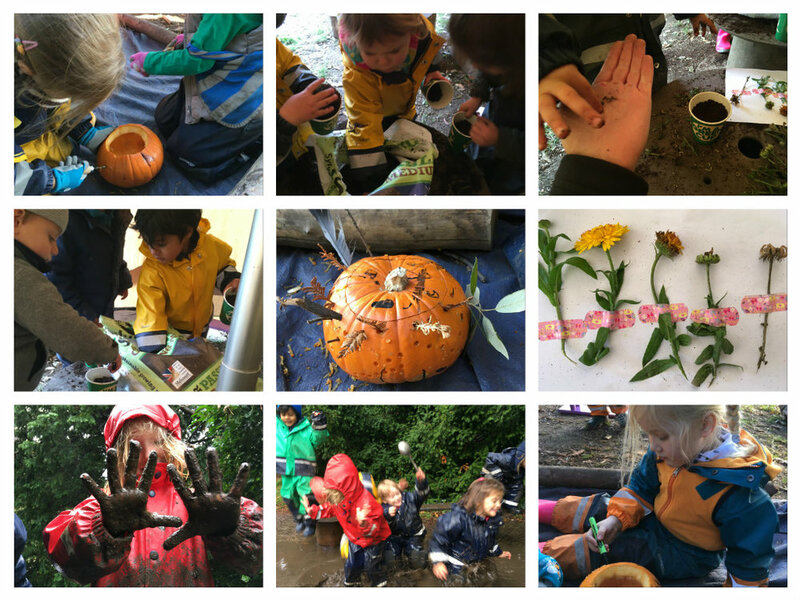 Two of the children suggested decorating theirs with sticks, feathers and leaves, creating a beautiful pumpkin that celebrated both Halloween and the autumnal season. The arrival of the rain, huge muddy puddles and copious amounts of sloppy mud provided the children with an exciting end to the week. The mud kitchen was of course in full swing with a constant stream of pots, pans and teapots full of muddy concoctions mixed with holly leaves, sticks, petals and stones. Some of the children loved the challenge of the slippery muddy ‘hay-bales’ which provided them with many comical moments watching their friends slipping and sliding around. As one of the puddles grew in size one group decided upon using two large cable drums to build a bridge by using a plank across them, this allowed them to all line-up and jump off together. There were squeals of laughter as they landed in the puddle making the most enormous splash!